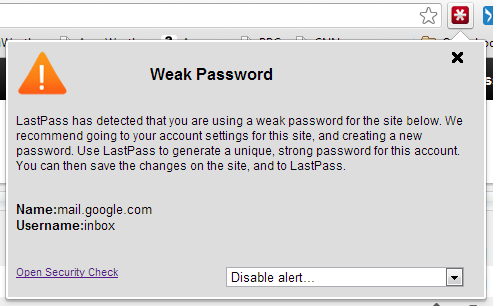 When you're logging in to a site, LastPass will flag the password as "weak" if it detects that you received a score below 50% for that specific password in the LastPass Security Challenge. It will also flag the password as a "duplicate" if you are using the same password for another login stored in LastPass. Since you are now logged in to the account, you can navigate directly to the password change page for the site, and use LastPass to generate a new, strong password. If the "generate" notification doesn't appear, you can always use the "Generate Password" function from the LastPass icon menu. Once you've submitted the changes to the site, LastPass will also ask you to confirm the changes, and you're done! If for some reason you do not want to update the password for the site, you can choose to "disable" the alert so you are not prompted again. You can also disable alerts entirely if you do not wish to use this feature. Remember, you can always re-run the LastPass Security Challenge to see a comprehensive analysis of your stored passwords - you can launch it from the new alerts directly, or you can open it from the Tools sub-menu in the LastPass icon.